Orchard Fresh Nutrition : I've gone nuts! I've gone nuts. I've always been a little bit nutty, but my nuttiness has escalated of late. The truth is, I've been going nuts every day. But why not go nuts? Did you know that a healthy 30g handful of nuts helps control your weight, lowers your risk of heart disease by 30-50%, lowers mortality by 20%, reduces your risk of Type 2 Diabetes and also reduces your LDL (the 'bad') cholesterol? Just 30g of nuts provides protein, fibre, antioxidants, iron, healthy fats, vitamin E, potassium, magnesium and plant sterols. Basically, this is a recipe for a healthy heart, healthy muscles, healthy skin and more energy = a happy and healthy body! An infographic of the benefits of a handful of nuts from Nuts For Life. I'll be honest, I have previously been a little sceptical of nuts. You see, although they are packed full of goodness, nuts are between 45-75% fat, depending on the variety. How can something with such a high fat content be part of a healthy diet? How would eating such a food on a regular basis affect my weight? Well, it's all a bit nutty really. Since adding a handful of nuts to my diet (a mixture of almonds, walnuts, pecans, macademias, brazil nuts, cashews and chestnuts in my porridge, muesli bars, snacks, meals and desserts) my weight has remained unchanged. Huh? That's right, I've added about 900kj and 22g fat to my diet each day without eliminating anything else, and my weight has stayed the same. In all honesty, I'm wishing I went nutty sooner! But how can this be so? 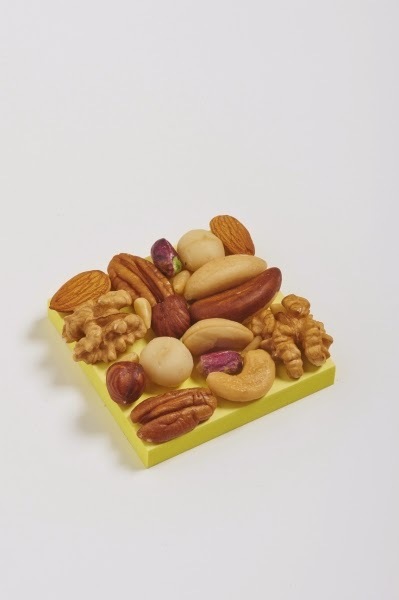 As explained on the wonderfully informative Nuts for Life website, your one stop shop for the latest nutty news, nuts help you feel full due to their high protein and fibre content. Secondly, not all of the calories in nuts are digested! Between 5 and 15% of the energy in nuts passes straight through your digestive system without being digested. So you can have your cake nuts and eat them too! The third reason nuts help to keep you trim and terrific is that they are hard to digest, so basically your body has to work for it nuts! This increases your metabolism and means some energy will be expended whilst digesting the nuts. But wait, how much exactly is "a handful" of nuts? The recommended daily portion of nuts is 30g. 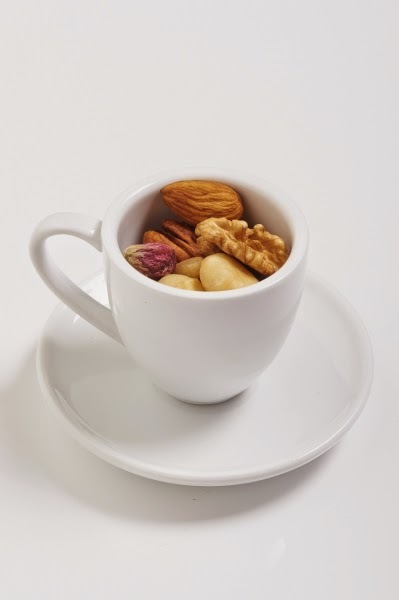 You could weigh and portion out your nuts, or you could measure out one third of a cup of nuts, an espresso cup full of nuts, or the equivalent size of a Post-It-Note. I do hope this post has inspired you to get a little nutty this winter! The winter months are a wonderful time to incorporate some nuts into your diet. As I mentioned earlier, my nut consumption has increased lately, with nuts in my muesli, porridge, muesli bars, crumbles, tagines, stir fries, pastas, rice, cous cous dishes and even as a garnish for vegetable side dishes. If you're keen to go nuts but you're not quite sure how, check out this recipe collection or register to receive these recipe books from Nuts for Life. 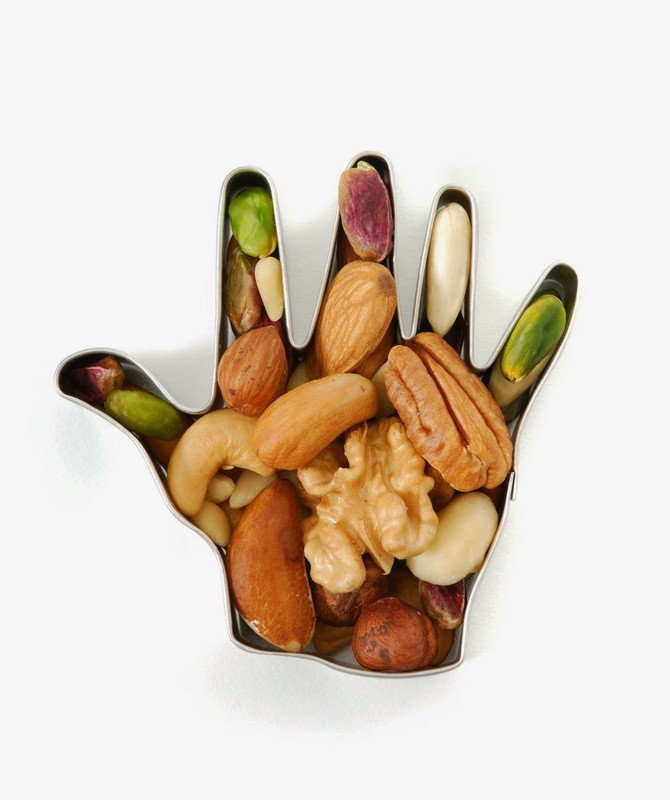 I'd love to know if you get your healthy handful each day, and if so, how? Until next time, stay happy, healthy and nutty!